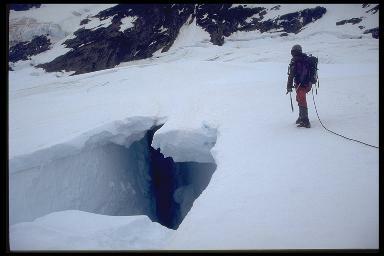 A typical crevasse on the Bonar glacier, just beneath the north west ridge of Mt Aspiring. Due to rain, mist and general 20m visibility (you couldn't even see the person on the other end of the rope at times) we had to navigate by compass across the glacier at 3AM. Fortunately things had improved on our return and we managed to avoid the precarious snow bridges of the early morning and return safely to our snow cave beneath Mt French... as the rain set in again.